March's mosaic features lots of small surprises: a tail and a nose peeking from under birthday wrap, a ladybug walking across the snow, a hawk in the tree across the street, the first spring blooms, geese on a rooftop, tree trunks that look like elephant legs, goldfish in a TV set. 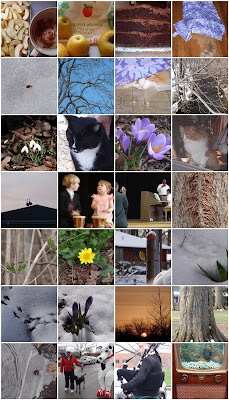 Every month, I've got lots of snapshots and only a few really well-composed, crisply focused photographs. I'm pretty sure that's what it will be like when I roll out April's 30 poems -- there are bound to be some lame clunkers, but I'm hoping for a few I can really be proud of. Gregory K. will once again host 30 Poets/30 Days with previously unpublished poems by favorite children's authors. Tricia Stohr-Hunt will interview 30 children's poets, beginning with Mary Ann Hoberman, the US Children's Poet Laureate. The Poetry Makers list is stellar! Jone MacCulloch shares Thirty Days, Thirty Students, Thirty Poems: original poems by students. Jone will also again offer the Poetry Postcard Project where original student poems are sent out on decorated postcards. Request yours now. Jama Rattigan is posting original poems & favorite recipes by some of the Poetry Friday regulars. At A Wrung Sponge, Andromeda will share a "haiga" (photo and haiku) each day. Kelly Fineman at Writing and Ruminating will continue the Building a Poetry Collection series she began last year -- selecting a poem a day in a kind of personal Poetry Tag (see Sylvia Vardell's version below) and providing analysis. I call this The University of Kelly Fineman because I learn so much in each post! Sylvia Vardell will be inviting poets to play Poetry Tag. She will invite poets to "play" along by offering a poem for readers to enjoy, then she will "tag" a poet who shares her/his own poem THAT IS CONNECTED to the previous poem in SOME way—by a theme, word, idea, tone-- and offers a sentence or two explaining that connection. The poets have responded enthusiastically: J. Patrick Lewis, X. J. Kennedy, Rebecca Kai Dotlich, Avis Harley, Lee Bennett Hopkins, Joyce Sidman, and more! Laura at Author Amok is highlighting the poets laureate of all 50 states this month! Fun Fun! Laura Salas will post a children's poem per day from a poetry book she loves. Lee Wind is publishing many new Teen voices during April for National Poetry Month. GLBTQ Teen Poetry. Mary Lee will be back with her Poetry Month Original Poem-a-Day About Teaching Or Learning on April 1, and we'll be both be back to work and to the blog on Monday, April 5.
and have a little nibble, yeah? there's always a creaky floorboard, isn't there? and put them into my mouth. I'll just even it up a bit, eh? Today, the first day of spring break, in between reading poetry posts, I'll be baking this cake for a friend's birthday party tonight. The roundup is at The Drift Record this week. My fourth graders have been creating cartoons at school and at home in our password protected ToonDoo Space for several months now. It has given them an alternative way to publish their writing in a "public" space where their classmates can comment on their work. They have made toons about themselves, about their theme, about how to have good sportsmanship in P.E., about their cat, and about books they've read. They've made up stories about ninjas, space travel, the Oscars, superheroes, and the Olympics. We've had great conversations about Internet safety, commenting etiquette, and appropriate social networking behavior. Recently, the staff at ToonDoo Spaces asked if my class would create a testimonial for them to run on a loop in their booth at a conference in Singapore. When I pitched the idea to the class, the response was a unanimous "YES!" Each child created three slides in Keynote, created some toons especially for their slides, and worked to clearly communicate what they like best about ToonDoo. Having an authentic audience outside of our class lifted the level of their work in a way I never would have expected. My favorite story from our testimonial project is the slide that shows the graph. The student who created it found a slide with a placeholder graph in the masters for the theme he had chosen. He was going to use that slide in his set. "You can't use that slide," I told him. "That's fake data. That doesn't say anything real about ToonDoo. If you want to have a graph, you have to gather some data." He interviewed the class, tallied up his results, went back to the slide with the graph, and with just a little help from me, got it to show his REAL data. How often do we get to hand a child a challenge that perfectly matches their skills and their will to meet or exceed our expectations? Greg Heffley and Ellie McDoodle, move over -- Aldo Zelnick is here! Aldo's grandmother, an artist, gives him a sketchbook at the beginning of summer break so he can keep track of all his artsy-fartsy ideas. Aldo does plenty of sketching, but he's also interested in words, thanks to his neighbor (a retired English teacher), Mr. Mot. It's Mr. Mot who gets Aldo started keeping track of all the interesting "A" words he uses, beginning with "artsy-fartsy". There's even a word gallery at the end of the book with all of Aldo's "A" words. Most of the words are defined (except for words like "antidisestablishmentarianism," which he has no idea what it means but likes it because it's so long), and some are illustrated (like the toilet beside "ad nauseum"). In this first book in the series, we meet 10 year-old Aldo's family -- his grandmother the painter, his mother the birder, his father, whose hobby is baking, and his 14 year-old athletic brother. Aldo's best friend Jack is a rock hound. They all live in Colorado. Aldo and Jack make a fort at the edge of the park near their house, under a big blue spruce whose branches grow almost all the way to the ground. Aldo leaves his notebook in a crook of the branches. When he comes back, he finds drawings in his notebook! Someone has found their fort, found his notebook, and DRAWN IN IT! Finding the culprit (who strikes again at least once more) is the main story line in ARTSY-FARTSY, but there are plenty of entertaining sub-stories. In one, Aldo, who would rather watch TV and play video games, is forced to play baseball. It starts badly (and humorously) but has a surprising turn in the end. Aldo is a character I like a lot, and I think kids will like, too. The second book in the series, BOGUS, is due out this spring, and promises to be filled with "more hand-drawn comics, rock-candy B words, and accounts of his everyday adventures." Looks like Aldo's dad's baking will be a key part of the story in BOGUS. This is a seemingly simple story with lots going on. A great book to read and re-read, over and over. On one level, it's the story of how a sweater gets made, from the feeding of the sheep, to the shearing, cleaning, drying, carding, spinning, dying, and finally the knitting. 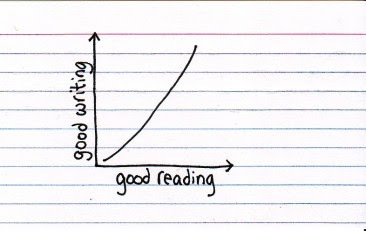 It's also a story with satisfying repetition. "What are you doing?" the little girl asks, over and over again, and her mother patiently tells her each time. It's is a story that has a rhyming phrase on every page of text: "Snowy day, corn and hay," when the sheep are being fed; "Deepest blue, messy brew," when the wool is being dyed. And this is a story about farm life throughout the seasons. Careful attention to the details in the pictures reveals that the seasons are changing from winter to spring, summer, and fall. It's snowing again by the time the little girl is wearing her new sweater and feeding the sheep for herself. Like I said, seemingly simple, but with LOTS going on. Dare you to read through it just once!! I was thrilled when I heard that Philippa Stratton is this year's Outstanding Educator in the Language Arts. This award is given each year by NCTE's Elementary Section Steering Committee. The recipient is celebrated at the Annual Convention's Elementary Get-Together--a great way to kick-off the conference each year. Every year, when the NCTE Outstanding Language Arts Educator is named by the Elementary Steering Committee, I want to cheer! Every one of them has impacted my learning and thinking in some way. We are so lucky in the field of elementary literacy to learn from so many amazing people. This year's award winner, Philippa Stratton, is the editorial director at Stenhouse Publishers. We LOVE Philippa. Mary Lee and I both know her through our work with Stenhouse but, before we began writing and before we knew Philippa, we learned so much because of all that she did for our learning as teachers. The announcement on the NCTE website states, "In many ways, Philippa essentially created the idea of the 'professional book' for teachers, an innovation that has had an enormous impact on how teachers learn and view themselves as professionals for nearly three decades." 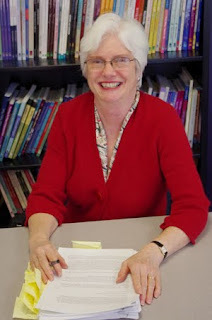 Philippa has worked with many authors including Donald Graves, Lucy Calkins, Ralph Fletcher, Georgia Heard, Harvey Daniels, Stephanie Harvey, Marie Clay, and Regie Routman. Anyone who has worked with Philippa feels very lucky to have worked with her. She seems to bring out the best in people and has worked her whole life to bring the voices of teachers out into the world. 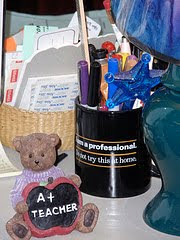 Her belief in teachers and teachers as learners and professionals drives all that she does. And the philosophy she has about classrooms is clear in all of her work. If you have ever read a professional book, you've most likely been impacted by Philippa. I have learned more from professional books and teacher-authors than I have learned from anything else throughout my teaching career. Before Twitter and Facebook, these professional books connected me with the people who were thinking about the same things I was thinking about in the classroom. These professional authors became my first Professional Learning Network--one that I continue to rely on. Can you imagine the world as teachers without professional books as we know them? Can you imagine your classroom without the influence of people like Regie Routman, Donald Graves, Lucy Calkins and Ralph Fletcher? Can you imagine your professional life without the anticipation of the next professional book that will help you grow as a teacher? I certainly can't. Philippa has had an incredible influence on my work and the work of almost every teacher I know. Her work has helped us stay grounded in what we believe and helped us to trust ourselves as learners and professionals for the last 3 decades. I can't wait to join in the celebration at NCTE's Annual Convention in Orlando this coming November! I am pretty sure it will be a standing-room-only event! I'll verse you in chess. to see who's the best. You observe while I play. I can't quite believe I'm going to do this: I'm challenging myself to write a poem a day about teaching and/or learning during Poetry Month (April). If so many of you can do a Slice of Life every day in March, surely I can write something that will pass for poetry every day in April! You can be a casual observer, you can join Franki and put on a cheerleading skirt, or you can verse me and write your own poem about teaching and/or learning. I'll post it here, or link to your post. Stacy has the roundup today at Some Novel Ideas. I wish I could send this book back to my 9 year-old self. I would have loved everything about it -- its small size, its thick pages, the shimmery end papers, the illustrations, the dedication to ME!!! ("This one is for Mary Lee..."). I would have set aside THE BORROWERS (after all, I would have been in my 10th or 12th reading of it) and made a space in my imagination for fairies. Flory, the spunky, prideful, demanding, brave night fairy whose wings are accidentally (we find out later) crunched by a brown bat, would have become one of my Favorite Characters Of All Time. The garden in this book would have been as exotic to me as a night fairy who learns to survive without wings. I grew up in a small town in a very dry region out west, and although we had trees and green grass in town, I never experienced lushness until I was an exchange student to Germany in high school. There were only a few squirrels in our town at that time (living in the big old elms near the elementary school in the center of town) and I had never seen a hummingbird like the one Flory so wants to ride, nor a preying mantis like the one she fends off with a big thorn. I smile to think about my young self reading this book, because I envision my old self as the old woman who tends the garden. I'm pretty sure young me couldn't have imagined growing up to become that old woman! 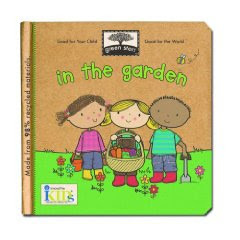 My garden isn't as big as the one in this book, but it's got the squirrels, the flowering tree, the bird feeder, hummingbirds that visit, if not nest, and occasionally a preying mantis. And I like to think there's a spot out there where a night fairy could survive until her wings grew back. We are having a Selections Book Fair at our school this week. What great timing because today, the newest book-THE WIMPY KID MOVIE DIARY by Jeff Kinney was released! Love having a hot-off-the-press book! Especially this one. I have to admit that I have not read all of the books in this series. To keep up with reading for a K-5 library, I tend to only read 1-2 books in most series. I've read one to two and enjoyed them. But this book is different and I think it is my absolute favorite! This is not really a book about Greg. Not totally. 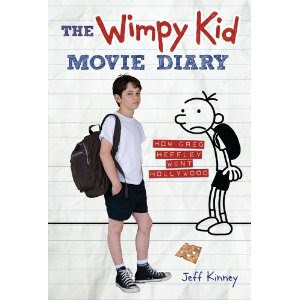 Instead, in this book, Jeff Kinney tells about the process of turning his book into the upcoming DIARY OF A WIMPY KID movie. I have not yet read the book--it just arrived at 2:30 Tuesday. But, I did spend lots of time looking through it and I am really excited about the possibilities. To have a resource like this about how a movie is made--what could be better? I have been doing a bit with movie-making, stop motion, etc. in the library and kids are doing amazing things. This new Wimpy Kid book will be a fun addition to the things we know about movie-making. The book begins at the beginning and how Jeff Kinney created the book. Actual journal pages and drawings are included. It also tells the story of how the actor who plays Greg, got the part. Then the story goes on from there. This book is packed--199 pages packed--with color photos, pages from scripts, call sheets, Jeff Kinney's illustrations and more. Whether you are a fan of The Diary of a Wimpy Kid series or not, this is a GREAT book! So far, my favorite pages are pages 40-43 where we learn the secret of the moldy cheese in the movie. I won't give away the movie secret but you will definitely want to read those pages soon after you get this book. I am excited to dig into this book and read it cover to cover. So many great pieces to share with kids about the characters, the process of this movie and movie-making in general. I imagine we'll see a lot of transfer from this book to the kinds of possibilities our kids see in their own movie making. I picked up I CAN HELP by David Hyde Costello at Cover to Cover yesterday. What a great book for new readers. I am always looking for books that new readers can read on their own but I am picky about them. I want the story to be good and the pictures to be important and I want these simple beginning books to be books worth reading. Well, this one certainly is. This is a great book. Illustrations tell a great story and the surprise ending made me laugh out loud. I just wasn't expecting it and it is very cute! This is a great book for reading aloud to young children and also for K-1 classrooms. Perfect for kids just learning to read. As a parent, you will only live through your child's fourth grade year one time. As a teacher, I've lived through fourth grade more than 20 times. Trust me when I tell you that in almost every case, your child will make it through "That Reading Phase." Some children come into fourth grade, find the graphic novels in the classroom or school library, and proceed to exist on a reading diet comprised almost exclusively of graphic novels. You might think your child will never read a book with pages full of text, but what you're missing is that your child is reading voraciously. And in about January or February, your child will be full to the brim of graphic novels and ready to try some of the other books that the teacher or his/her friends recommend. Other children come into fourth grade and pick right up with the series they were reading in 3rd grade: Geronimo Stilton or Magic Tree House or Rotten School. That's fine. That's why I have these comfortable, familiar friends in my classroom library. I also have a few books in lots of other series so that when they're ready, I can introduce them to new characters who will become comfortable, familiar friends. I don't have a problem with readers who love a series. Lots of adults are series readers. But it is my goal in fourth grade to teach children the strategies they will need to choose a stand-alone book and enjoy characters and stories on a one-book basis. I model this during read aloud time when as a class we enjoy a book together. Parents can help to balance a series reader's reading diet by reading aloud to their child. Many children come into fourth grade lacking the reading stamina it takes to sit still and concentrate for 30 or more minutes of silent reading. They read picture books and browse the nonfiction books and I despair that they will ever sit still for anything longer than 32 pages of words and pictures. But then March rolls around, and I look up from my desk and there they are, thoroughly engrossed in THE YEAR OF THE DOG, and hoping that I have THE YEAR OF THE RAT for them to read next, and excited to hear about WHERE THE MOUNTAIN MEETS THE MOON. One of the things that works in favor of prying your child out of "That Reading Phase" is that in fourth grade, the social nature of reading starts to catch up with their reading ability. They want to read the books that are being made into movies, and they want to read the books that their friends are recommending. They love to talk about books and have opinions about books. Fourth grade is a perfect time to start a parent/child reading club with some of your child's friends. If you start reading and discussing books with your child now, you will open doors for conversations you never would have been able to have without the help of the story or the characters in the books. If your child is currently in a reading phase that you are feeling will never end, try to relax and live with it for a few more months. Keep them reading and reading and reading, even if it's not the kind of book you want them to to be reading for the rest of their lives, or even a year from now. Take them to the library and require them to bring home a variety of genres. Listen to books on tape in the car. And finally, remember that your child will never get too old for read aloud. One of the best gifts you can give to your child is to read to them from both the books they love and the ones you love. 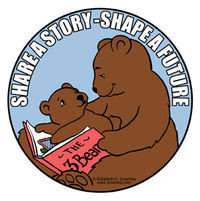 This post is a part of Share a Story, Shape a Future, an annual blog event to promote literacy, celebrate books, and provide resources for parents, teachers, and readers everywhere. This year's theme was "It Takes a Village to Raise a Reader." Each day a different kidlitosphere blogger served as host for the posting of several other bloggers. Visit the host blogs' sites to find a complete blog roll for each day. Topics of the day encompassed the relationship aspect of helping children learn to read: parent-child and teacher-parent partnerships, literacy outreach; and libraries, to name a few. Creative literacy in all its forms (writing, art, computers) was the topic of the day. This was the day for exploring the different genres of nonfiction (biography and memoir, science, nature, math, etc), as well as the use (or not) of historical fiction. Bloggers shared thematic book lists that include newer titles and the classics we loved as kids. On this day, talk is about how to approach reading when your interests and your child's don't match. It may be that you don't like to read but your child does, how to raise the reader you're not, and dealing with the "pressure" of feeling forced to read. This week, we are hosting a Selections Book Fair at our school. I cannot say enough about the amazing selection of books that they provide for a book fair. And I was able to add several of the titles that kids are currently excited about. The library is filled with kids' favorite characters and authors. It is also filled with new books, ready to be discovered. The excitement is nonstop. When I first took the job as librarian at an elementary school, Lester Laminack told me that I would love it--that it would be like working in an ice-cream shop and that every day, I would be making people happy. A good comparison, I thought. I think of this chat with Lester often and I was reminded of it again today. The looks on the kids' faces when they enter the book fair are no different than I imagine they would be if they were entering an ice cream shop. They are beside themselves with excitement. I must admit that by 1:00 each day, I am wiped out. 25 excited children every hour for several days in a row and I need some extra caffeine to keep up. This is the perfect time of the year for a Book Fair. A change of pace and scenery is such fun. Anticipating spring reading is also fun. But I forget my favorite part about book fair. I love listening in on the kids when they shop. I love this week because it gives me a break in routine to really listen in and to notice things that I don't often have time to notice as we rush through 45 minute classes. I notice the ways so many of them are talking about books! I loved that a child who didn't know many books or book characters not too long ago, screams across the library, "Mrs. Sibberson--is this the new Mo Willems book?" when he notices CAT THE CAT. I love watching a child sit on the floor for 35 minutes straight reading the new Babymouse book cover to cover, thrilled to have discovered one she hasn't read and looking up every so often to make sure no one will stop her reading. I love seeing fans of THE LIGHTNING THIEF hover around a new graphic novel about Zeus and looking at the back cover to see that there are more in the series about Greek Mythology. And I love that two older girls found a book they had never heard of (I hadn't either) but previewed together and are now dying to read it. It reminds them of one of their favorite authors and they are anticipating finding another author to love. There is nothing like the anticipation of reading a great book. I think that is what book fair is about this week. Kids know that whether they buy a book or not, we will get many of these new books for our library. Really, Lester's thinking about an ice cream shop rang so true today. The thing about ice cream is that it is gone after a few minutes. But a good book? Not so much. Dying To Meet You is written like the Regarding the.... series, billing itself as "a collection of actual letter and documents written over the course of one summer and pertaining to the strange events that took place in a certain house located at 43 Old Cemetery Road in an otherwise quiet town called Ghastly, Illinois." As in the Regarding the.... books, the reader has to make lots of inferences, but the pages aren't quite so packed with information that might be pertinent to the story (or that might be there just to amuse the reader). The story line is more straight forward, and the letters and documents are more clearly linked. A famous children's author moves into a Victorian mansion to finish the book he's working on. Unfortunately, he has a bad case of writer's block, and also unfortunately, he finds that the mansion is already occupied by a ghost and an 11 year-old boy who has been mostly abandoned by his globe-trotting parents. The writer, the ghost and the boy are at odds at first, but wind up working together towards a common goal. One of my favorite things about this book are the puns with the names: Ghastly, Illinois; a children's book writer named I. B. Grumply; Anita Sale, a real estate agent; E. Gadds, a lawyer. And on, and on. A very fun read for 3rd-6th graders. Reviews: 100 Scope Notes, Dr. Quinn's Book Blog, TheHappyNappyBookseller, Literate Lives. Kate and Sarah Klise's website. Two weeks ago, Melissa Sweet was the visiting author at our school. There are three great things about an author visit: all the learning that takes place before the visit, the excitement of meeting the author on the day of the visit, and the learning that lingers after the author has gone back home! Second graders learning about Ohio animals made constellations of the animals after reading TUPELO RIDES THE RAILS. These students wrote about their grandmothers after reading CARMINE: A LITTLE MORE RED. If you're getting ready to meet an illustrator, you might want to take some sketching lessons online and sketch an illustration to go along with your wolf research. Third graders practiced letter writing by writing letters to Melissa Sweet. Fourth graders who read A RIVER OF WORDS illustrated poems in the style of Melissa Sweet, using collage and watercolors. ...and TUPELO inspired mapping the community. We loved Melissa Sweet's books, and loved meeting her and hearing the stories about how her ideas turned into those books. She is everything her name says she is: SWEET! I just discovered these sweet little "Green Start Books" that I love! I just picked up a few to add to baby presents. 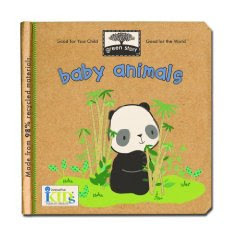 These books are little board books, made from 98% recycled materials. They are great little books--about the size of an average board book. The pages are sturdy and the illustrations are quite fun. Each book deals with some aspect of our Earth. The two that I just picked up are called IN THE GARDEN and BABY ANIMALS. They are both done so well for young children. The text is simple and predictable. The books invite interaction. And even though they are short, they teach so much. As I mentioned, I am buying these for baby gifts but I think they are also perfect for new readers. These would be great for 1st and 2nd graders since the text is supportive and the topics are interesting. Hopefully, they'll add more to the collection. I am excited about this new series. Fractions are on stage in fourth grade -- it's that time of year when every skill that's been mastered (hopefully) so far gets a part in the play. Multiplication and division are still the stars, but they wear different costumes and are sometimes unrecognizable at first. The reason for understanding factors and multiples stands proudly in the spotlight with its chest thrust out, and the moment when the audience can anticipate the moves of every character on the stage, knowing almost before they do who's greater, lesser, equal, improper or mixed...oh, that moment...it is among my favorites every year. Numbers and the four operations of mathematics come to life for Mary Cornish in her poem, Numbers. I give you two stanzas; click through to Poetry 180 for the whole poem. The whole poem is here; the round up is at Teaching Books. Celebrating READ ACROSS AMERICA with Song! We had a great READ ACROSS AMERICA Celebration today at school. Last year, we had a type of "carnival"--lots of activities for kids to do around books. It was a fun day and we all had a great time. This year, we decided to celebrate in a different way and it was even more fun! The band RMT came to our school today to celebrate literacy through song. I had heard about what a great show this band does and I thought that reminding kids that songs tell stories made sense for the day. The band is a popular Central Ohio band and they have an amazing program called Songs of America. The show is almost an hour long and it tells the history of America through song. It was a GREAT way to celebrate literacy. First of all, the energy was amazing. The show has the feel of a very fun concert! The songs were put together to show the history of our country. As the band played, they told the pieces of history that were needed to understand the importance of the music they were sharing. Giant wall-size slides played behind them--showing the times and events in history that they were sharing. Kids and teachers sang along, clapped along, and danced along. There was such a good balance of types of music shared. My favorite was the last song of the show that they wrote themselves called "American Song". (This is the last song on the clip below and also one that I am buying from iTunes next time I shop there.) The kids left smiling, laughing and, of course, dancing. My ten-year old daughter saw this same show on Veteran's Day last year. I must say that this is a great show to celebrate any day. A great holiday show or a great show for anytime of year. This is a fun show for kids of all ages and for adults. The YouTube video below shows clips of the show but imagine 500 smiling, singing, dancing children in the audience when you watch it. If you have any money left for a show like this, I would definitely recommend getting them to your school or library. I am trying to figure out how to do things like this on a smaller level in the school library having bands, artists, speakers, scientists, etc. in for school library events. A few whole school events like this one but then grade-level or interest-type events through the year during lunch recess, etc. So much learning and fun from events like these. I think this was, by far, my favorite celebration of READ ACROSS AMERICA since the tradition began! It's the time of year in 4th grade for fractions and fractiousness. I prefer the fractions. The Lion's Share is a great fable that gets readers to think about fractions AND good behavior. The Lion hosts a dinner for all of the animals. Ant is on time; the other animals are not. Ant is shocked at the appalling table manners of the other animals. When it's time for dessert, the Lion serves a cake and says, "Please help yourself." The Elephant sets the tone by taking half the cake as his serving. Each animal in turn takes half of what is left, and then criticizes Ant when the crumbs she's left with fall apart, leaving none for the Lion. Ant apologizes to Lion and offers to bake him a special cake from her grandmother's recipe. Not to be outdone, each animal in turn offers to bake double the number of cakes of the animal before him, leaving Elephant with quite a task! In the end, Lion and Ant share the special strawberry sponge cake...half and half. Interview with the author at Classroom Book of the Week. As you know, we have great children's librarians at the Dublin Library. This week, George came in to share books and songs with our K-2 students. As usual, he was a hit . George actually has Rock-Star Status with our K-2 students. It was a fun afternoon as he got kids excited about our upcoming Pajama Party Story Time at the Dublin Library. George shared many new books, several that I hadn't seen. One that he shared was SPOT IT! FIND THE HIDDEN CREATURES by Delphine Chedru. I have already had requests for it so I ordered one right away. Kids love the I SPY books and I love new and unique ways that authors create seek and find books for kids. A favorite newer series of mine is SPOT 7. In the SPOT 7 books, readers have to spot 7 differences between two seemingly identical photos. There are lots of things to like about this new SPOT IT! book. First of all, the hidden items are fun to find. Instead of photos, the illustrator creates a colorful pattern on each page. The pattern/illustrations repeat across the page but when you look more closely, you find what is hidden. The text is very simple. The book starts out telling the reader to "Find the owl who needs her glasses..." and then continues this list type book with a new item to find on each page. Some pages are easier than others but it is quite a fun book. I can see kids of all ages liking this one. I can see why George chose to share it and why it has been the most requested book since his visit!